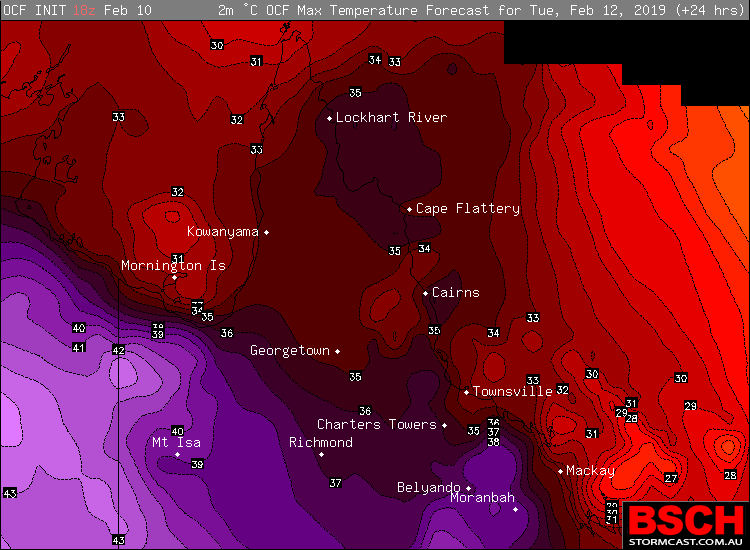 As many residents of North QLD know, after a cyclone comes the heat.. and the heat is certainly coming in after the recent flood event across the region, which is only going to make conditions repulsive across the region. Above image – Wednesday maximums via OCF / BSCH. Over the past few days, temperatures have pushed not only back to normal but above average across the Northern QLD and Tropical North QLD region. 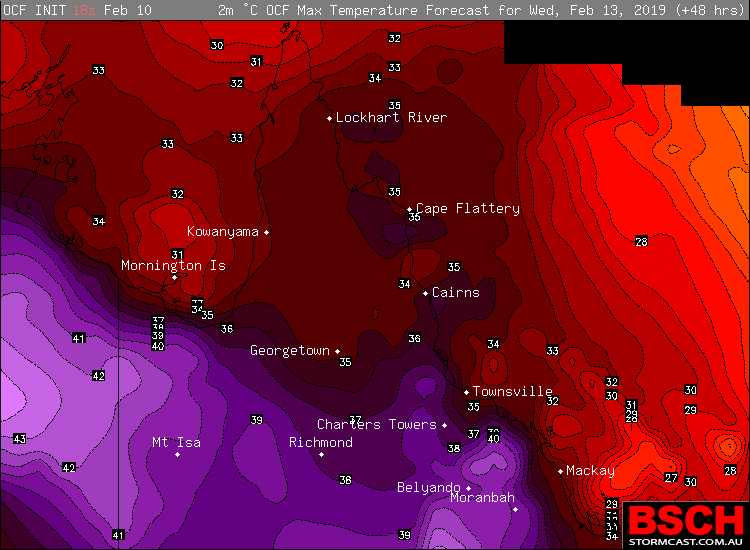 Townsville saw its warmest day in a month yesterday with 34ºc, Cairns its warmest since before Christmas with 38ºc! While areas across Northern Inland and North West QLD finally climbed back into the mid 30’s after being in the low 20’s as maximums over the past 1-2 weeks. 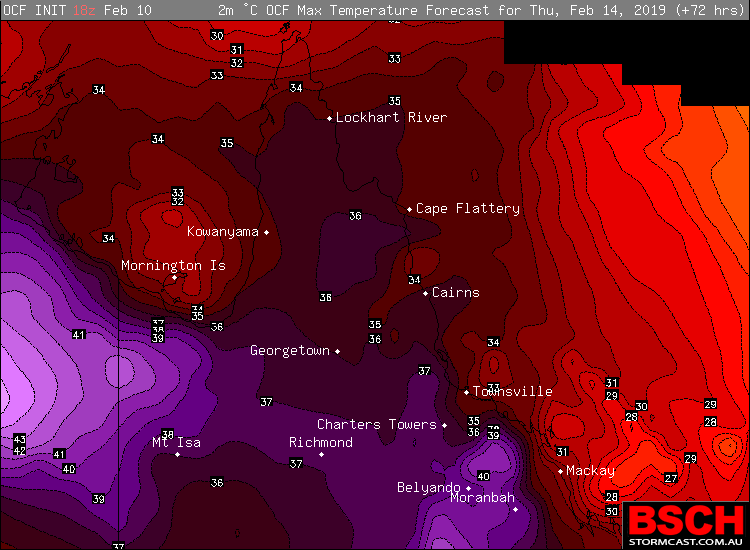 Across the next few days, temperatures are expected to only climb as a warming air mass moves over the region and combines with hot dry air coming from Inland Australia and pushing into Coastal parts of QLD courtesy of a coastal surface trough. This combination will allow maximums during Monday through to Thursday to climb well above average across Coastal parts of North QLD where daily maximums should reach the mid to high 30’s, while Northern Inland QLD should sit just above average in the mid to high 30’s as well. Some locations may even touch 40ºc. When you add this repulsive heat with extreme moisture laden surface conditions, and even ongoing extreme flooding… not only does the risk of waterborne diseases increase as waterborne insects will thrive, but even if the air itself is dry, the surface conditions where people exist, work, function.. will be extremely humid. This will make it feel much worse than what it really is.